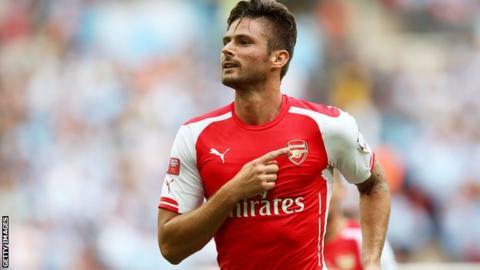 Arsenal striker Olivier Giroud is available for this weekend's Premier League meeting with Manchester United. The France international, 28, had been ruled out until the new year with a broken leg suffered against Everton in August, but has returned sooner than expected. "He is three or four weeks ahead of schedule," manager Arsene Wenger said. "Originally we planned to have him back for competition at the beginning of next year. So he's one month ahead." Giroud came off the bench to score a 90th-minute equaliser at Goodison Park on 23 August but broke his left tibia in the closing seconds of the game. Wenger also confirmed midfielder Mikel Arteta, 32, who suffered a hamstring injury in the 3-3 Champions League draw with Anderlecht on 4 November, is also ready to return. "It's just a question of how ready they are, but they are available," Wenger added on Arsenal.com. Giroud's return follows Theo Walcott's comeback from a cruciate knee ligament injury earlier this month and further bolsters Wenger's attacking options. "We have Giroud back, we have Walcott back," Wenger said. "Slowly they will integrate into the team again and give us different options."